At McCann Redi-Mix Inc., we look for employees that strive to the best in everything they do – everyday. Whether on a Project Management Team or operating heavy equipment, our employees are champions of hardwork and skill. They thrive in an environment of dedicated teamwork with a commitment to exceptional and total customer service. If these are some of the qualities that describe you, then you've come to the right place. As jobs become available, they will be posted on this page so check back often for careers that may be of interest to you. Regardless always feel free to submit your applicable information through the resume form on this page. 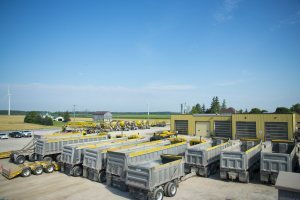 McCann RediMix, located in Dashwood, Ontario is hiring concrete form setters and labourers. Experience in the concrete construction trade is an asset but we are willing to train the right candidates. Projects involve but are not limited to concrete footings, foundation walls, insulated concrete panel forming, concrete floors and flatwork. Highly competitive wages, pension plan and benefits. We are seeking career minded individuals who will grow with our company. "McCann Redi-Mix Inc welcomes and encourages applications from people with disabilities. Accommodations are available on request for candidates taking part in all aspects of the selection process. We will accommodate the needs of people with disabilities in the hiring process."